Jerrie Cobb, who was part of the FLATs program, poses next to the Mercury space capsule in the 1960s. 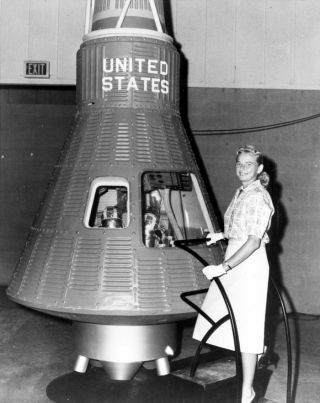 In this historical photo from the U.S. space agency, Jerrie Cobb poses next to a Mercury spaceship capsule. Although she never flew in space, Cobb, along with twenty-four other women, underwent physical tests similar to those taken by the Mercury astronauts with the belief that she might become an astronaut trainee. All the women who participated in the program, known as First Lady Astronaut Trainees, were skilled pilots. Dr. Randy Lovelace, a NASA scientist who had conducted the official Mercury program physicals, administered the tests at his private clinic without official NASA sanction. Cobb passed all the training exercises, ranking in the top 2% of all astronaut candidates of both genders. While she was sworn in as a consultant to Administrator James Webb on the issue of women in space, mounting political pressure and internal opposition lead NASA to restrict its official astronaut training program to men despite campaigning by the thirteen finalists of the FLAT program. After three years, Cobb left NASA for the jungles of the Amazon, where she has spent four decades as a solo pilot delivering food, medicine, and other aid to the indigenous people. She has received the Amelia Earhart Medal, the Harmon Trophy, the Pioneer Woman Award, the Bishop Wright Air Industry Award, and many other decorations for her tireless years of humanitarian service.